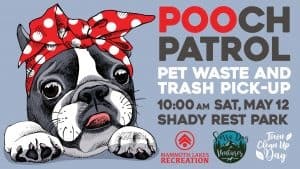 Saturday, May 12th is Town Clean-Up Day in Mammoth Lakes, and your friends at Mammoth Lakes Recreation and Sierra Dog Ventures are teaming up for the Town’s first-ever POOCH PATROL! We’ll be working to pick-up pet wastes and other litter. Volunteers are asked to bring pooper-scoopers and/or 5-gal buckets if they have them. We’ll supply bags and gloves. This event is pet friendly, so bring your canine companions! We’ll be giving out pet treats, people treats and beverages.